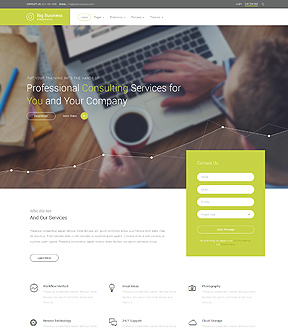 Welcome to Big Business a responsive WordPress business theme suitable for any style business website. The design includes a quick contact form right near the top for users to quickly reach out to you. The Masonry widget has been modified a bit with CSS to display your portfolio of work in a clean easy to use manor for visitors. We've included 12 extensions on this design to power it with the features any business site can use. The S5 LikeMe plugin is showcased on content areas and adds a nice touch to this area. The testimonials area if powered by the Tab Show widget. We also included a feature to display the Flex menu with a solid background including the highlight color behind the logo or a transparent style background. With other small features throughout, this theme comes packed and is ready to go for any business style website. Be sure to check out the demo to see it all in action!